I am Michaela Davidson and I live in Lake Cowichan, a beautiful little town nestled in the Cowichan Valley on Vancouver Island, in British Columbia, Canada. My husband Bob and I have lived here for 20 years, and for the past ten, we have been developing a unique and beautiful Gallery, which is separate from but attached to our home. The Gallery is surrounded with gardens, ponds, stained glass and sculptures, and everyone is welcome to tour the grounds. A cedar door with a large stained glass window of the Lake and trees, as well as two large windows greet you as you enter the Gallery. The entire building boasts 17 stained glass windows. 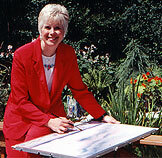 Many people ask me how I paint an original painting. Because of the difficulty of watercolor painting, I usually do all my finished painting in my studio. From time to time I may do a vignette on site, but that painting will never be the finished work. I only sketch on location, using a soft pencil and small sketchbook. Completing as many as 50 two-inch value sketches in one-day trip, I record the time of day, the light direction, and mood evoked in me. I make notes on the colors I see, listing them as the pigments used in the finished painting. Years later I will be able to go back to the sketch and remember what inspired me in the scene. Because the original paintings sell so quickly, we have decided not to show any on the web site. If you wish to view my new originals please email and let us know. We can then contact you to discuss which series interest you and send you pictures of available paintings. This past winter has been an eventful one. Bob and Michaela went on a two week cruise through the Caribbean. They brought back some beautiful hand stitched â��MOLASâ�� that are made by the Cuna Indians just off the coast of Panama. We framed them in an acid free rag mat have now have them on display in the gallery. If you drop into the gallery be sure to check out the fine workmanship. Michaela is having a one woman exhibition at the Nanaimo Arts Council Gallery in Rutherford Mall in Nanaimo from August 1, to 31, 2001. This exhibition includes all the paintings and poems from the two books â��Out of the Mistâ�� and â��Evolutionâ�� written by Michaela last year. The books are beautifully printed on acid free rag print paper and hand bound. She is presently working on a third book. There will be a Masquarade auction at the Chemainus Theatre this May 5 to raise funds for the Chemainus Theatre. Several local artists will be producing some unusual paintings for this show, and all VERY ONE OF A KIND. The artists were all asked to produce a FABULOUS FAKE. A hint - Michaelaâ��s donation to the cause is a copy of Gauginâ��s Tahitian Women with Lotus blossums (with a twist). Check out the original seen in this news article. If you would like to bid on this original watercolour call Chemainus Theatre at 1-800-565-7738. You must attend in order to see the rest of the artistâ��s â��fabulous fakesâ��, but remember these are really one of a kind pieces and very collectible.